One of the most feminine and graceful of attires, that women in the south of India wear, is the famed half saree. The languid grace of this gorgeous ensemble is also a sign of maturity and reaching of womanhood. It’s a great way to celebrate coming of age. The symbolic wearing of the half saree for the first time in fact is marked with a great deal of fanfare and celebartions. In the southern states of India, the first ever half saree is presented by the maternal grandparents. While in the southern states, the half saree continues to be the most worn of dresses; in the rest of India it has created quite a stir in the field of fashion. It’s a rage amongst all those who love the look of attires that tell the story of the past, of a culture steeped in traditions. Called by different names in the various vernacular languages , the half saree however has emerged a hot favorite not just as a mark of youthfulness and charm but also as a stunning outfit for all kinds of formal and semi formal occasions. What Does The Ensemble Comprise of ? Well quite honestly, it simply look like a very pretty long skirt , that is half draped with a gorgeous long dupatta called the voni. 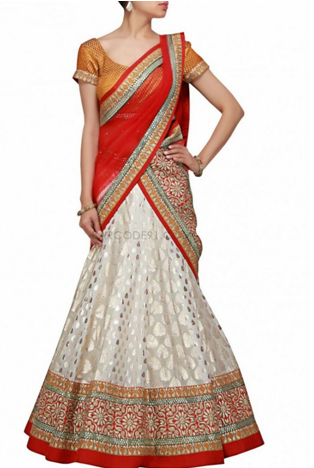 The dupatta is made to contrast or blend in with the hues of the skirt. The blouse, which is also the part of this ensemble, in the present times, has gotten as experimental as the rest of the dress. The beauty of the garment allows you to drape the voni-or the longish dupatta in a variety of ways to give the half saree a very different look each time. The perfect way to make that tiny waist seem all the more attractive is this simple drape that works the best with fine quality voni. After having worn the skirt and the top, take one end of the dupatta, tucking in one corner of that end into the side. Now begin draping the voni as you would the pallu of any saree. The other end goes over the left shoulder in pleats and falls in a gorgeous cascade from there. Remember that you have tucked in just one corner to the side of the waist and the other corner therefore simply goes over the back, giving it a rather pretty shape. Now those of you wanting to break the usual saree look would want to get the most out of your lehenga as well as your drape, and what better way to do it then, disengaging the two slightly leaving the structured style aside. So begin by choosing the skirt in a completely different color from the voni or the drape. The skirt should be voluminous. The top in this case should be the kind that covers the midriff and gives more shape to your waist. Now begin by draping the voni not from the other side of the waist but from the left side, allowing the drape to go all the way over your back as low as possible exposing the beauty of the drape and then as in the picture below, you may use the pallu in three different ways-the first when you take it mermaid style not covering the front of the body-second, as you let the loose end drape over your left arm rather regally, and third -allowing it to fall over the shoulder. So when you are little more conscious of your figure and cannot afford to show too much of the midriff and also want to wear something that is not too binding across the front of the upper torso –this style of drape is perfect. Take the end of the voni and tuck one corner on the left side allowing the other part to hang triangularly across the side. Now take the rest of the voni and bring it over your right shoulder from the back, dropping it across the front. Secure with a pin. Now take the rest of the length ensuring that you create a smart looking deep V with it allowing the lower corner of the end to fall in a graceful manner across the length of your left side. It looks fabulous with vonis that have heavy borders. You will of course need to pin this in three different places-the left and right shoulders and at the centre where the V formation is. Use a set of coordinated saree clips. Dressing up for a glamorous gathering? The half saree has been mutated enough to fit into every occasion and will look fabulous when the voni is of some sheer fabric which then can be made to hang from the right shoulder, without taking across the front of the torso. Another style great for the evening is a mermaid cut or A- line skirt topped with a blouson or jacket with the voni in a sheer fabric. Here one can see the bright green skirt in complete contrast. What this stunning diva has done is to use the voni just like a saree pallu but not pinning it on the shoulder. This loose and flowing style is simply amazing with softer and sheerer fabrics. 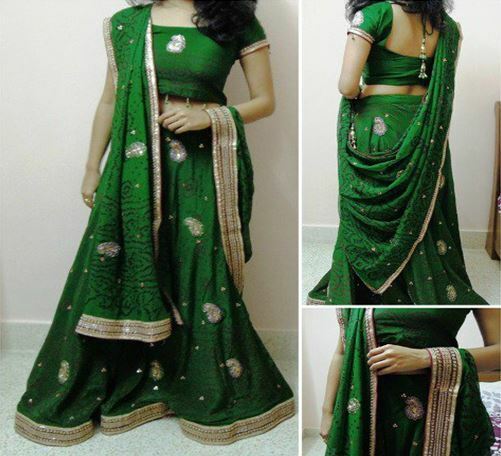 One can simply begin draping from the left side of the skirt allowing the border to show at the front of the saree. 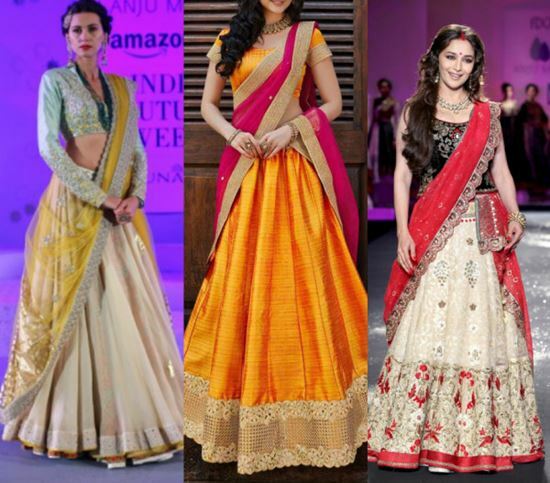 The tops one wears with the half sarees too have taken on a new avatar, as have the skirts that now come in scintillatingly figure highlighting cuts such as the mermaid cut, A-line cut, the peacock cut and so on. The blouses too could have the conventional cuts or may be fashioned into jacket or koti style. The voni could have a variety of usage in terms of appliqués, motifs and borders which will help you choose the draping style that enhances the look of your half saree. As with any other outfit, the half saree has reinvented itself like all other traditional wear and has emerged a close competitor with the ghaghra and choli of the north, and with more girls wanting to get experimental with their look, trying the half saree or a mekhala chadar, is as common as trying the Bengali or the Gujarati style of saree draping.